Where does car electricity come from? Where does electricity in a car come from ? When you approach your car and try to unlock the doors, you might insert the key into the door keyhole and turn it, or with most car these days, reach into your pocket to find the car’s key fob, and just press a button to disarm the security system and unlock the doors. Any way, the car will unlock, and with some cars, it can unlock all doors, turn on the dome light, or do other things. Electricity in a car does these things. Where does the system find electric power to cover the energy requirement to do this? From the battery of course. The car’s battery stores energy to be used when needed, and the battery does so only when the engine is not running. The battery uses its stored electricity energy to power any equipment /devices, such as vehicle security systems, when the engine is not running. When the engine is running, it’s another story (which will be explained below). There are various functions of a battery, among which is the most significant one: providing energy for starting the engine, that is, to power the starter motor to crank the engine. Some people classify car battery as a “starting battery”. Note: In the old days, cranking a car engine is done by hand, even 1980’s Land Cruisers still had a crank handle hole on their bumpers. We can start its engine using muscle power! (mind you though, it is very heavy). That is the main purpose of a car battery: providing power to start the engine. And as mentioned above, a battery is also the source of electricity for the so many electric stuff of today’s cars. The second main purpose of the battery is to act as a voltage stabilizer, after the engine has started. 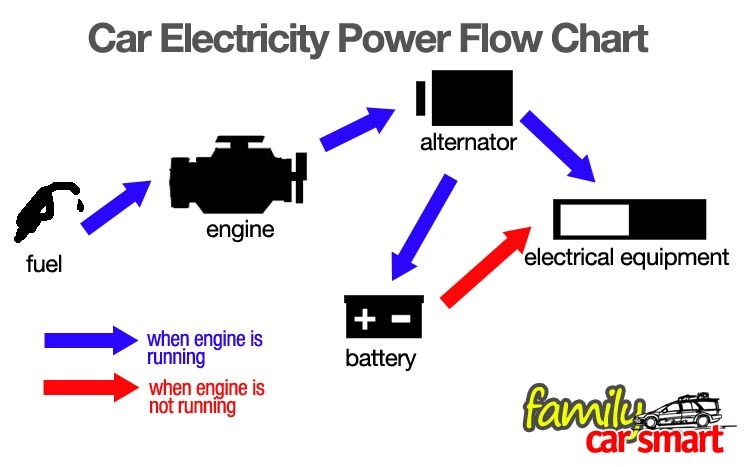 So when an engine runs, the battery’s role as electric power supply is replaced by the alternator. rotational movement it gets from the car’s engine to turn an armature inside it, around wire windings, to make electricity. 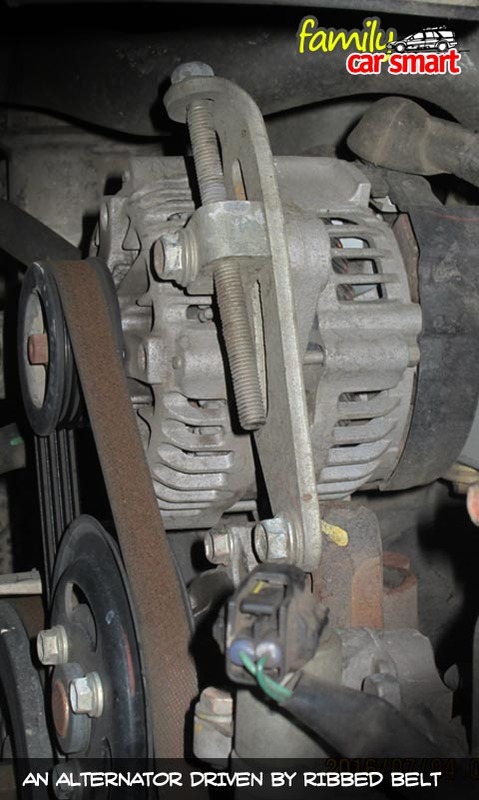 Thus the alternator only works when the car engine is running. During its work, it serves two functions: one is to supply power for car’s electric equipment, the other is to charge the battery. 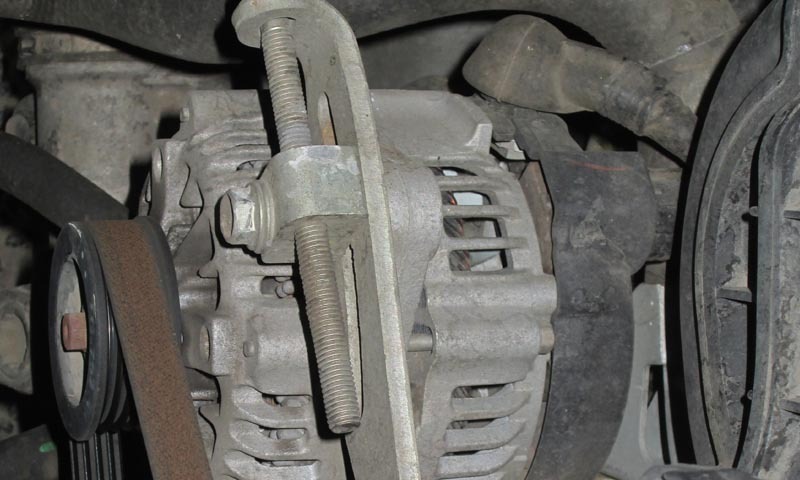 And when the alternator runs its function, its close friend, the battery, helps stabilizing the voltage and current. So after the engine is running, the battery serves as an electricity stabilizer. The power supply duty? We’ll, it’s borne by the alternator. To help explaining these roles, see the accompanying chart. So where does the electricity really come from? So where does the electricity come from in a car? Following the above description, it is now easy to tell: The power comes from the alternator, some is stored in the battery. 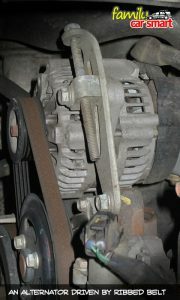 The alternator gets it from rotational movement at its pulley, connected with a belt to the engine’s crankshaft pulley. And the engine gets its power from …… fuel. Yes, that is where car electricity comes from. It gets back to fuel. Fuel makes the source of electricity in a car. A car engine is usually the only power source for a car when the engine is running. Aside from powering the wheels to propel the car, an engine also provides power for many equipment in a car or the engine itself, such as the alternator (as we discuss here), air conditioner compressor, power steering pump (or motor for electric and electric-hydraulic one), air compressor (usually in large vehicles), radiator fan, water pump (these equipment are called engine accessories). Many small cars now have electric power steering and radiator fan. They are powered indirectly by the engine through the car’s electrical circuit. The following tips are highly recommended to safeguard a car electrical circuits /components. When replacing battery with a new one: Some circuits need constant supply of electricity from a battery. Some cars might need a power backup when replacing a battery with a new one to prevent the circuits from losing power. Always check with the car owner’s, or better yet, with a workshop manual on how to change battery. Because the battery helps stabilizing current /voltage when the alternator is supplying electricity, it is strongly recommended to always keep a battery installed when the engine is running. Do not remove a car battery when the engine is running. Voltage /current surge or ripple might damage delicate car electrical circuits. That’s all I can share for now about car electricity basics. Those who are familiar with or have studied mechanical engineering must have known about this subject because it is usually covered in the Automotive Engineering or maybe the Internal Combustion Engine course. I’d be glad if anyone can share a comment or knowledge here. I’ll be happy to share and discuss more about car battery maintenance some time later. If you have any comment or suggestion, just leave a it in the comment box below. Thank you for visiting this page. Hey Interesting Post. I was not even aware that the power comes from Fuel. Thanks for the tips to safeguard a car while changing a battery; didn’t know all that needs to be done. It will save me a lot of time and money doing it properly. Hi Shireen. Thank you for the reply. The engine provides power for all the accessories, including power steering, air conditioner compressor, water pump for engine cooling, and other equipment. Only part of produced power from fuel actually goes to the wheels.